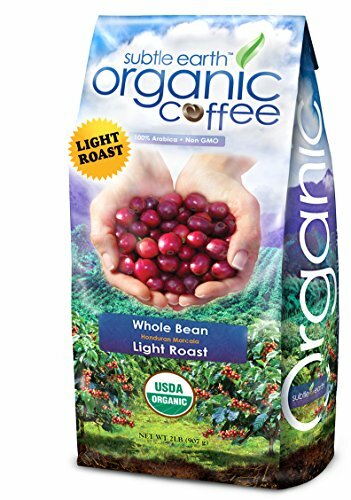 2LB Cafe Don Pablo Subtle Earth Organic Gourmet Coffee - Light Roast - Whole Bean Coffee USDA Certified Organic, 2 Pound by Cafe Don Pablo at Jakis Cafe. Hurry! Limited time offer. Offer valid only while supplies last. Full Body, with a Deep rich Chocolaty Flavor, and a clean finish. Smooth Milk Chocolate, with Notes of Honey, Caramel and Cocoa. Organic Certified. Full Body, with a Deep rich Chocolaty Flavor, and a clean finish. Smooth Milk Chocolate, with Notes of Honey, Caramel and Cocoa. Organic Certified. This Coffee is an exceptional Honduran coffee from the Marcala region. No chemical inputs are used. The cherries (fruit of the coffee bean), are composted and used as fertilizer, along with vermiculture, and fewer insects are present at the altitude that it's grown, so no insecticides are necessary. If there ever is a bug problem, farmers sometimes plant peppers as a repellent. The coffee is very dense, and thus has depth of flavor and we are able to roast it just right to bring out its natural flavor characteristics and a wonderful sweetness. All our coffees are roasted fresh to order in multiple small batch roasters (30-60 kilos) at our facility in Miami. We are a family of growers and roasters, laser-focused on quality, and because of our volume and innovative model, we are able to deliver an excellent quality 100% organic coffee, at a price that represents a considerable value. Name: Subtle Earth Organic - Certification: Organic - Origin: Honduras - Region: Marcala - Importer: Burke Brands LLC - Grade: Strictly High Grown (SHG) - Roast Degree: Light Roast - Agtron: 53/68 - Comments: Smooth Milk Chocolate, with Notes of Honey, Caramel and Cocoa.